Tokyo, March 8, 2019 — Casio Computer Co., Ltd., announced today the release of a new addition to its EDIFICE line of high-performance sports chronographs that combine dynamic design with advanced technology. The new ECB-900DB, to be available in two models, evokes the advanced performance and sporty styling of motorsports. The ECB-900DB delivers advanced functionality to assist the race logistics of Scuderia Toro Rosso F1 team, which EDIFICE supports as a team partner. Critical for racing, the stopwatch is accurate to 1/1,000th of a second and records up to 200 lap times while also displaying average speed. 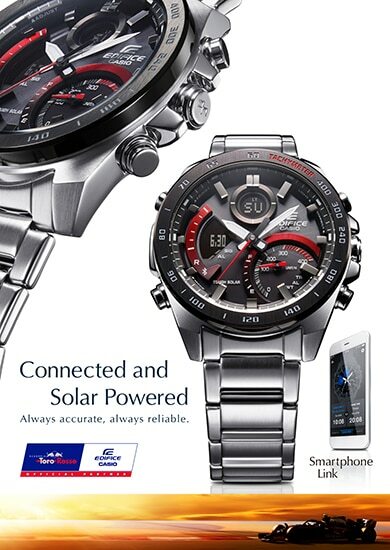 With the EDIFICE Connected app installed on a smartphone, the user can connect the watch and app to manage lap times from the smartphone. The app also ensures the watch receives precise timing data, which is critical for races where even a thousandth of a second can make the difference. The app also makes it easy for the user to access the diverse features of the watch, for instance selecting the world time from among 300 cities. The design of the ECB-900DB evokes motorsports with Tachymeter markings on the bezel, and an in-dial at the 4 o’clock position with a multidimensional design inspired by the speedometer of a sports car. The in-dial also features a gradation finish that enhances the sporty look of the watch. In addition, LCDs at the 12 and 9 o’clock positions provide an accessible view of a variety of key information, while twin LED lights illuminate the digital displays and analog face, respectively. All of these features are designed to deliver optimum visibility for users. 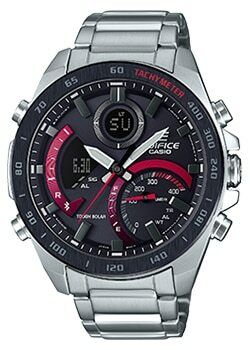 World time, battery indicator, daylight saving time auto switching, full auto-calendar, button operation tone on/off, double LED light, etc. Operates within accuracy of a regular quartz watch (at ±15 seconds per month) when used without pairing with a smartphone.